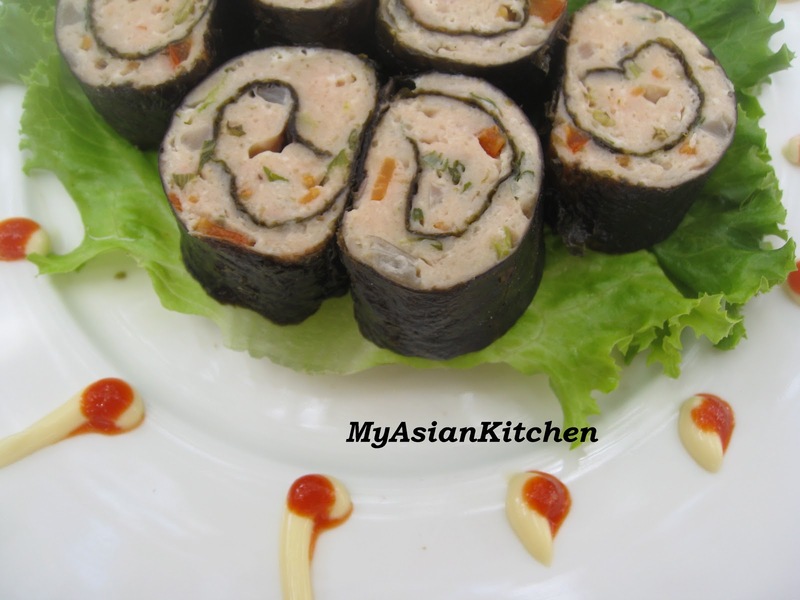 These days I like to used minced chicken for my cooking.One of the dish I created was :Steamed Chicken Roll Wrapped with Nori.I get the idea when I was making sushi for my family.This dish is not only easy and simple to prepare but healthy and delicious!! 1:Combine all ingredients together in a large mixing bowl,mix well with spatula or large spoon. 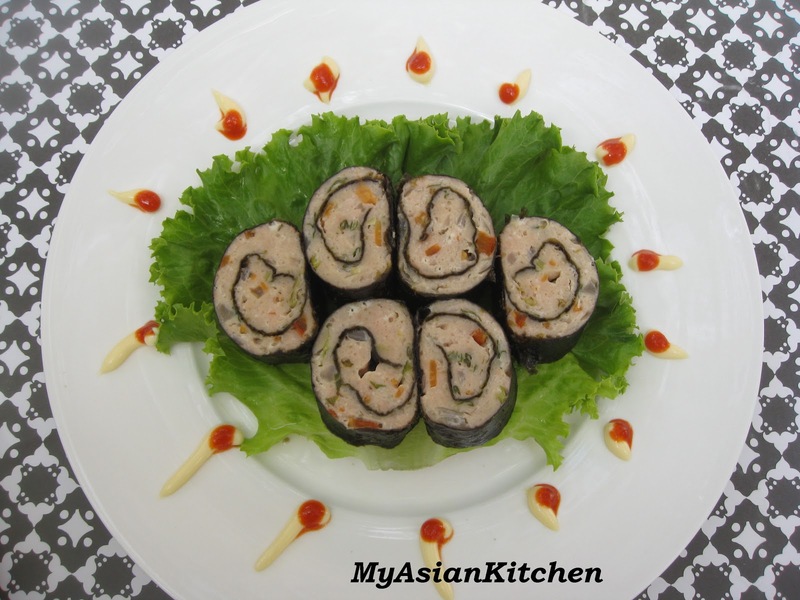 2:Place a piece of nori on a clean cutting board.The rough side facing upward.Scoop 2 tbsp chicken mixture and spread on the nori evenly.Smooth the chicken mixture on the nori by dipping your fingers in cold water. 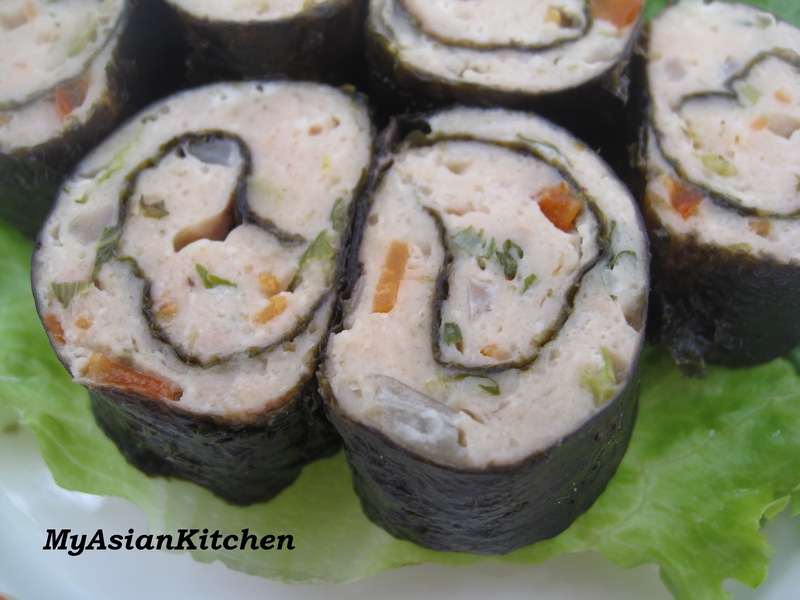 3:Roll up the nori and seal the end edges tightly.Prepare steamer with water at high heat.Repeat the same procedure until all the chicken mixture used up. 4:When water rolling boil,place rolled nori in a gasket before place in the steamer.Steam chicken roll at high heat for 20 minutes or longer until cooked. 5:Remove chicken roll from steamer and let it cool for 5 minutes before cut each roll into 6 - 8 pieces.Serve warm with your desire dipping sauce. Love this blog and recipes! I want to make my own Sushi. Would you post the how to for me? Thank you for dropping by and your kind words ☺..If you're looking for the method and steps of sushi wrapping in my blog,please use the google search box to look for it..maybe you can use word like salmon maki or sushi.. Thank you and hope you enjoy it!! OMg ,this looks absolutely delicious & mouth watering !